First, I would like to thank everyone who participated this week. I really, really needed a drink and you provided admirably. You guys sure didn’t make this easy. Picking a winner will be a purely subjective choice and I hope you will take that into consideration when viewing the results. I maintain that everyone who participates is a winner anyway. Bruce Clark The lovely head on the brew with cool sweat dripping down the sides made this one for me. The addition of the nuts was a lovely bonus too. Tamia I can taste and smell the peaty flavor of the Laphroaig and cheer you on in the publishing of your book so you can sit back and enjoy that special scotch. gerardbaron Since you submitted two photos I choose to use your first one for the contest although it must have been one heck of a party even though all the wine glasses seem to be intact. Wine, my favorite tipple. The guy who is pouring does not look like he want to share it or he is just afraid it won’t be appreciated by the busload of people who just walked in. Skodadriver You submitted four images and I took the liberty of selecting the first one as your entry although it was difficult to pass up all that scotch. One submission was an empty glass however and that had to have been a serious mistake. There is a lot of wine in your shot considering you wanted me to focus on the water. I enjoy the background here. Lots to look at and seems to be one of those places everyone has been to at one time or another. atupdate I remember seeing this shot before but it still amazes me. We all thank you for being the designated driver. hadi I really like this one. 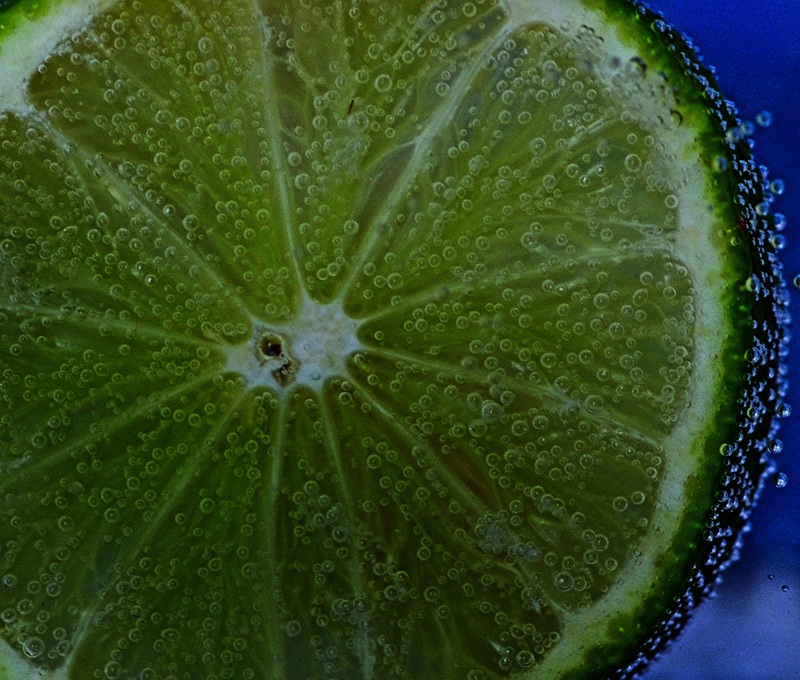 The focus is not on the drink so much as the slice of lime but it looks so refreshing with all those bubbles that you can be forgiven. charliezap A wonderful collection of wines with the hint of a deck to enjoy them on and a view to boot. tessfully A wonderfully crafted shot. 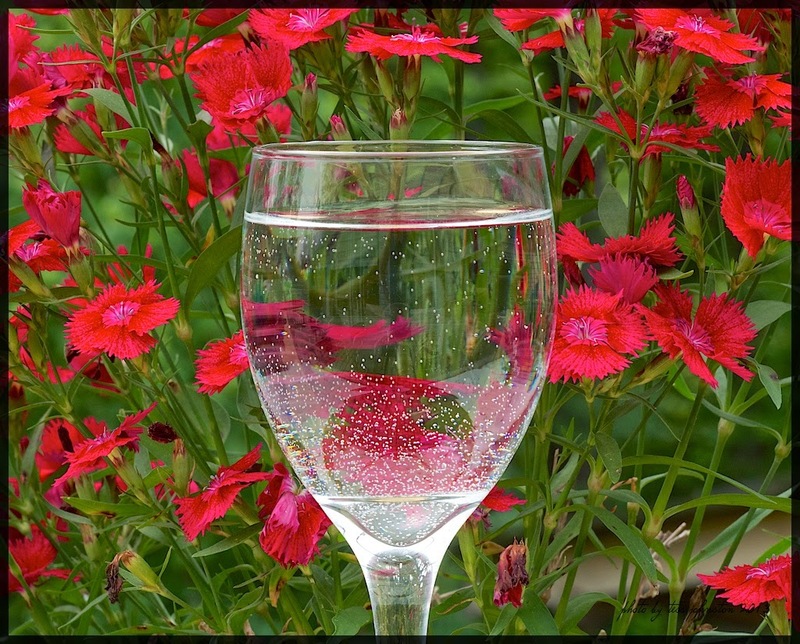 The tartness of the water hits my tongue as I look at the glass and the wonderful red flowers behind are just lovely. Outis I believe we may have imbibed some of this brewers IPA in our travels. They cast a long shadow indeed. rod_grant You brought some class to the table. I feel I have to slip into something a little dressy to sit back on the lovely leather couch and have a sip. The lighting here is a treat. SpecialK Great bottle placement. Orange soda takes me straight back to my childhood. normhead That is the most appealing mug of beer I have seen in a while. Nice head and, though lacking in the darker amber of my preferred beer, it is lovely to behold. Kerrowdown Another bottle of Laphroaig and commemorating its 200 years of existence. Love that it is in B&W as it contributes to it smoky qualities. crazydrake Something tells me you are a fan of Highland Park. Quite an impressive array and all ages represented. Arjay Bee I have no idea what a milo is and milk is not my favorite beverage but I do so want some of that. It is really appealing and the background colors are perfect. jchorst I haven’t decided if you have a lot of friends or just drink a lot and don’t like to get up in between to fix the next one. I like the background here too. Are those shimmery bits in the back glassware? Makes the whole think sparkle. sealonsf Now we’re talking. A martini and in B&W. Humphrey Bogart comes to mind although I am going to have to dock you for that bright red cherry. I know it added a spot of color but really, in a martini!!!!!! eva Yes please. I love the DOF here. Nicely done. noelcmn You should win simply for indicating that I may be underage. You are a lovely man. I do like the multicolor foil wrapping with their reflections. Good job. seanix Freezing the fruit instead of risking a watered down drink is very clever. I like the colors too. Please tell me what I am drinking. Are you all ready? 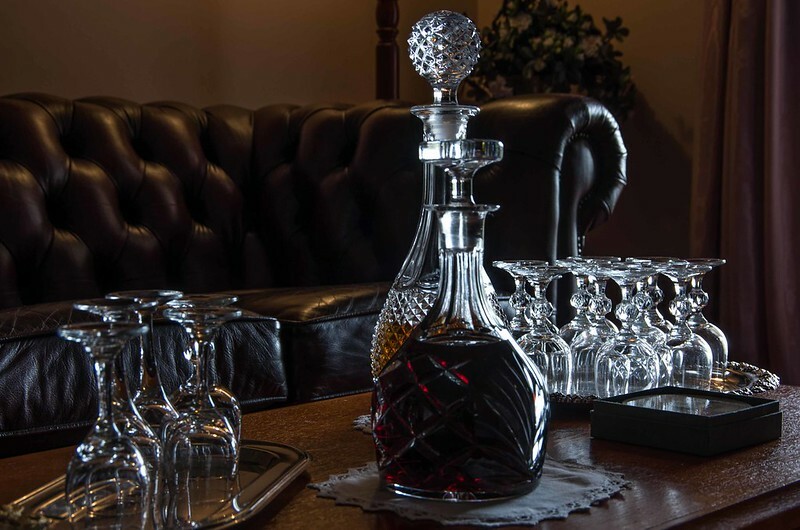 Have your "hair of the dog" next to your chair? OK then. First place goes to rod_grant. He just made me feel special and grown up and lovely. 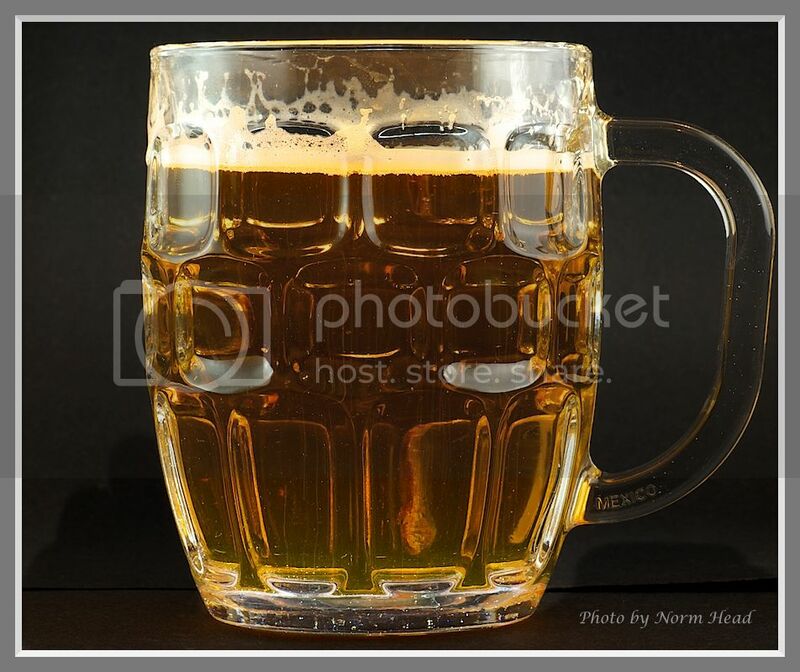 Second place goes to normhead for the best looking mug of beer this year. Third place goes to sealonsf even though I had to forgive him those cherries and he forgot the olive. hadi for making a lime look so good and Tess for making me give up scotch and settle for water. Last edited by slowpez; 07-24-2016 at 01:46 PM. Lovely choice of a winner there, great ambiance to that image, evoking cultural drinking, What beautiful contrast between the light on the glass and the darker surroundings. Nicely composed too! Congrats Rod_grant. Great shot! And extended to Normhead (who an resist a beer after that image ) and Sealonsf and the HM's Hadi and Tamia. What a great challenge, stunning interpretations of the theme, so a hearty thanks to our- uhm-should that be an inebriated judge for that and the comments. Always appreciated. Great stuff ya all! And Oh, Milo is a Malt Energy Drink, and can also be served with water. Great either hot or old, or better with ice on a hot day. My young people had it every night on our camp last week. Last edited by noelcmn; 07-21-2016 at 12:58 AM. Well done Rod, and of course Susan for running this challenge. Just looking at the winners makes me want to reconsider my designated driver offer. Great images and thanks for the comments Susan. Thank you for the fun, I agree with your first choice, very tasteful. Thanks for the third place! 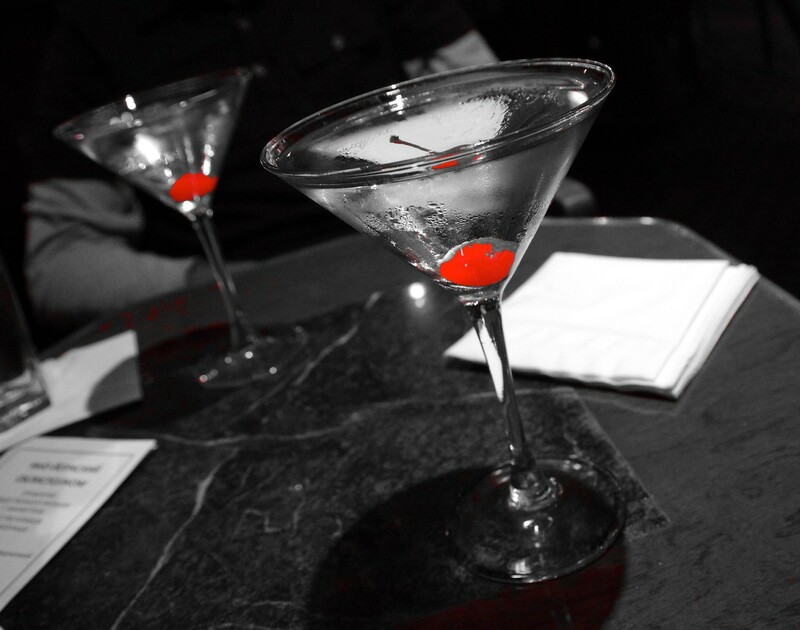 I also like an olive with my martini the best, but I won't say no to one with a cherry. Bogart is my favorite actor of all time so I'm happy to hear my photo brought him to mind. One small detail, regarding gender, I'm a she not a he. I'm a she not a he. I probably should have known that or most likely did at one time or another. My apologies (but chances are you won't be able to count on me remembering it the next time. Thanks Susan and others for the kind words. Congrats Rod .... beautiful image. Also, congratulations to Norman and Sealonsf for 2nd and 3rd place (love the select colour in that photo!). Thank you so much for commenting on all the images Susan, and for posting my photo under the HMs (you named Tamia, but posted my image.) Fun challenge with great entries overall. Well done Rod, lovely inviting image. Congratulations Norm and Sealonsf for your evocative photos, too. And kudos to HMs and Tess for your HMs. Susan, while I'd love to have taken the glass of water photo, it belongs to Tess. Thanks for the comments and for this delicious challenge! A thousand apologies to both Tess and Tamia. I have corrected my error and appreciate your pointing it out. You are both such great photographers I can be forgiven for mixing you up. No apologies needed, Susan, not with all the wonderful tipples you had to sample to judge this contest, and thanks for the compliment!